Hello and welcome everyone to this edition of Graps and Claps taking me on a short trip to Prestwich for Futureshock Wrestling’s Underground 29 on a surprisingly sunny October evening. As ever with this blog, the day started a couple of hours earlier visiting the local drinking establishments along the way, which meant a trip to Bury on this occasion and first of all was a visit to The Trackside pub which is well on its way to challenging The Crown and Kettle for the ‘Pub of the Year’ award at the end of the year. 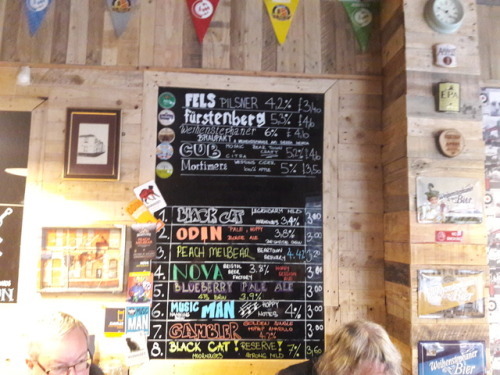 First drink was a 4.9% Gin Infused IPA from Brass Castle Brewery (£3.40) while I waited for our Geoff to turn up. The main attraction of The Trackside is the East Lancshire Railway attached to the pub with a range of trains entering the station, the like not seen since Thomas The Tank Engine was around back in the 80s/90s sadly not many Fat Controllers in sight nowadays. Next pint was a beer from a new Brewery which I have just read has something to do with J.W Lees, that drink you ask was a pint of 6% Boilerhouse Brewery IPA costing only £2.70 and while it was a good IPA it didn’t really taste its 6% strength. Next pub was The Robert Peel Wetherspoons across the way for a swift pint of £2.19 4.9% Liberation IPA whilst watching Frankie Dettori powering home another big winner at Ascot to win yours truly a massive £11 – woop woop. After this we then took to posh eaterie/drinking hole The Clarence for a sophisticated £3.25 (CAMRA discount) pint of 4% Capuccino Stout that was probably the best drink of the day, it was interesting to find out in here from our Geoff that most of the bars on Silver Street are a bit of a front for drugs which having gone to many bars on that street I am not surprised in the slightest. 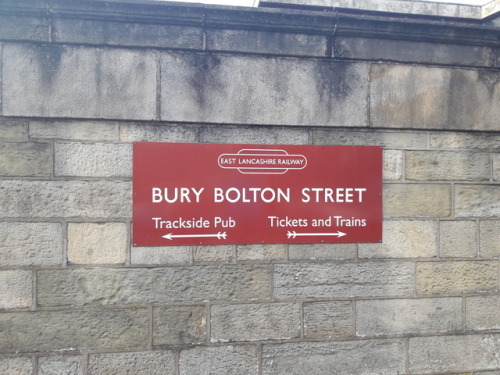 Last but not least before the Metrolink Journey to Prestwich was a visit to the new pub in town – The Thirsty Fish even though it is hidden away behind the bus station it is soon becoming a place to visit if you like your real ale and foreign lagers which drinks coming well under the £4. My pint in here was a 7% £3.50 pint of Moorhouse Black Cat Reserve whilst chatting to a random local about Brexit, Football and Russian Spy’s like you do on a Saturday afternoon in a pub. 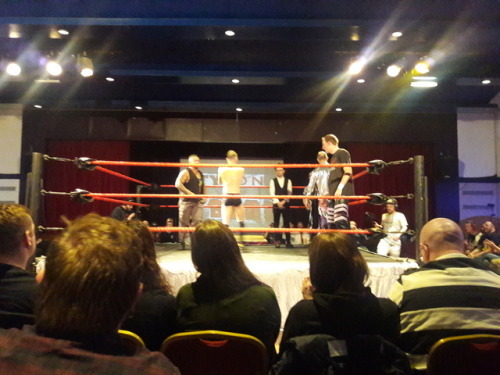 First match was a Tag Team contest that was originally scheduled to be title match but this was changed to a non-title match for some reason backstage, so for Danny Hope and Chris Egan the incentive was there to pick up a victory against T-Bone and Chris Ridgeway in the hope that they would then receive a title shot at a later date. Some inspired entrance music for Hope and Egan coming out to the George Michael classic ‘Outside’, Ridgeway and Bone have been having problems recently with Hope and Egan with Egan pinning T-Bone at the Tapped show a couple of weeks ago. The early stages of this match was Bone and Ridgeway working over Egan that was until Egan managed to get the hot tag to Danny Hope who came in and cleaned house and it wasn’t long after that Egan and Hope performed the double team old Hart Foundation finisher ‘The Heart Attack’ on Chris Ridgeway to get what some might call a surprise victory. After the match Egan got on the microphone to demand that next time at the show in Prestwich in December be a No DQ Tag Team Title Match which should be all kinds of fun. Next up was a Legacy Tournament match between J.J Webb and GOLFWANG!! Now as ever with Wolfie, the crowd were instantly against him and as a few I have discussed with in the past, he hasn’t really done anything of note that would turn him into a bad guy but it was the Joey Hayes match at Stockport Town Hall which turned people off him because let’s be honest when have you ever seen an edge of your seat Wolfgang match – answers on a postcard please? This was a relatively straight forward victory for Wolfgang as he dominated young Webb for a large portion of this match but J.J did at one stage lock in a Crab submission on Wolfie but sadly for J.J, Wolfie got to the ropes to break up the count. With Wolfie back at a standing base finished off J.J with a Suplex into a Stunner to get the win and advance in the Legacy Tournament. 3rd match was a Women’s division contest with Futureshock Academy graduate Hollie taking on one third of The Queen Bees in the form of Kasey Owens. Now in the last couple of months, The Queen Bees have been showing a bit of dissension in the ranks with Jayla Dark being the main culprit and the fall girl in all of there current mishaps. This in itself I thought was a very commendable effort by Hollie who proved she could hang with a more experienced opponent in Kasey Owens, the finish came after about 10 minutes when Jayla Dark once again ballsed it all up for the Queen Bees as she came in the ring and accidentally hit Kasey instantly flooring her, this left Kasey open to be finished off with a sweet running knee to Kasey for the victory – cue the AAAARRRGGGHH walk of shame for The Queen Bees as they buzzed off to the back. Half time main event now with a 3-way match between the veteran of the trio James Drake taking on two up and comers of the Futureshock wrestling scene – Luke Jacobs and Isiah Quinn respectively. Early part of this match was both Drake and Jacobs trying to frustrate Quinn but the purple pants wearing Quinn soon got on top flooring both Jacobs and Drake on the outside of the ring much to the disgust of the Prestwich faithful. Back in the ring though it was looking like it wouldn’t be Quinn’s night as Drake went for the victory hitting a 450 splash to Luke Jacobs but this was to be broken up by Quinn who chucked Drake out of the ring leaving him to pick up the scraps to pin Jacobs. After the match while he was gloating, both Drake and Jacobs beat up Quinn after the match to get at least some semblance of success for the evening leading us into the usual half time photos and for some reason no raffle on this evening – boooooooo!!!!! Back after the break we returned with Adrenaline Title action with the Champion Joey Hayes taking on former Adrenaline Champion Soner Dursun. Soner early on in the match hit a jumping neckbreaker to the ring apron to Joey which looked impressive but it wasn’t long till our champion Joey got back on the offensive but with that said both guys were looking for the win that was until Sam Bailey’s henchmen Rizzy Khan and Alex Boylin attacked both Dursun and Joey to cause the Double DQ as they build up to the feud ending match between Soner and Bailey at the Stockport show on the 18th November. Second to last match was to be Futureshock Heavyweight Champion Crater taking on the upstart and one of the shining lights of the North West scene Callum Corrie in what looked on paper to be the classic underdog taking on the monster bad guy match. Sadly though for Corrie this turned out to be a nightmare for him as he was press slammed launched onto the staging area and also over the top rope to the floor which looked vicious as hell. It didn’t get any better for Corrie as he was swiftly finished off with a Clothesline of Death from Crater for the Monster to carry on his rampage through the Futureshock locker room – god knows who the next challenger is?? Now time for your Main Event with Liverpool’s No.1 Zack Gibson taking on ‘Serious’ Kevin Lloyd in a Legacy Tournament match. The usual chants were out in force for Gibbo – ‘Shoes Off’, ‘Stand Up’ ‘Baldy Baldy’ if it was sung it was certainly directed at Gibson, In the grand scheme of things this was a match to get Kev over as a threat now he has gone on his own once again away from the Tag Team division and to be honest it worked as Kev picked up a momentum building victory over one of Futureshock’s biggest stars as Gibson got visibly frustrated that he couldn’t put away Kev leading to him getting pinned in just under 15 minutes in a good main event. I hope as ever you have enjoyed reading this review, any comments are welcome and I will be back with a review of Tidal Wrestling’s double header from The Temple of Boom in Leeds tomorrow evening. So until then – BYE! !